After the reveal of the new Tesla Model Y last week, company CEO Elon Musk hinted that there had been an easter egg in the presentation that just about everybody missed. 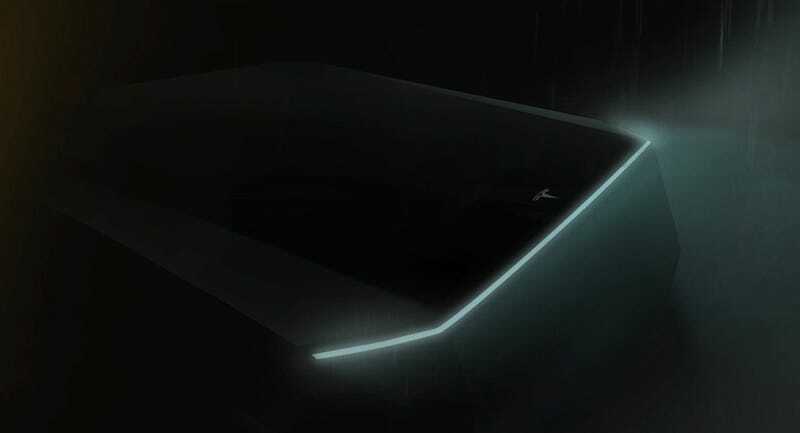 Turns out it was a teaser image of what’s supposed to be the upcoming Tesla pickup truck. Looking at the actual image, I’d be hard pressed to confirm that there was actually a pickup truck, or really anything, actually shown off. You’ve got a long, flat surface with a Tesla logo, another square flat surface at 90 degrees connected to that, and a light bar in the middle. If you squint at the back of the top surface, it looks like there’s a hard edge. What the hell are we looking at? Maybe, then, this is some sort of covered bed at the back of the truck? That would explain why all the surfaces are so flat and squared-off, as you would imagine the front of the truck would have a little more aerodynamic considerations and maybe a little more character. My coworker Jason suggested it could be the base of a stake-bed pickup. Perhaps it’s more likely that this was just a rush job to get a teaser ready for the Model Y presentation, or extra shape and details were intentionally left out to avoid spoiling the look of the truck. Or maybe, since Musk describes it as a cyberpunk truck, it’s not the same pickup as before. Maybe it’s some sort of self-driving land barge you just throw stuff on top of, hence the box shape. Whatever this is, I’m not going to get excited about what’s essentially a black image with a line drawn across it. There’s nothing there. I feel like I’m being trolled.